Enjoy our warm cozy cabin just yards from the lake! 4x4 access only for cold weather months! 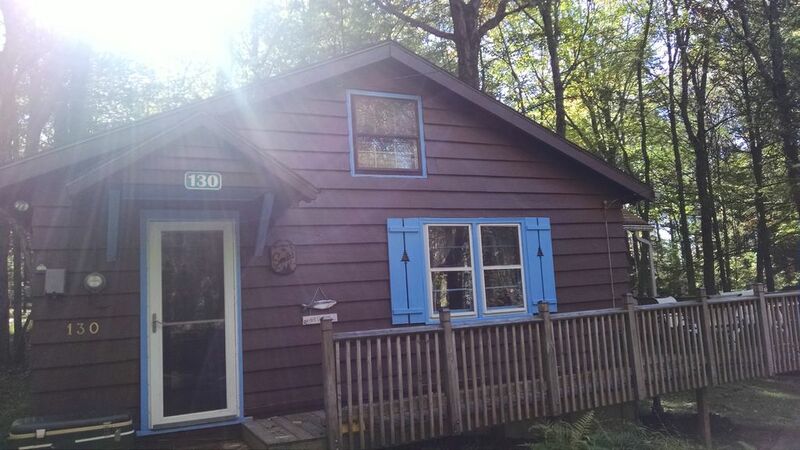 Adorable Cozy Cabin only YARDS from beautiful 13 mile Lake Wallenpaupack! Enjoy the natural coolness of the cabin and woods, the beauty of the lake, a campfire while watching the sunset on the lake. It's the best time of the year in the Poconos! So inexpensive right now! This is the perfect place if you're trying to get away from it all and relax for a few days or a few weeks. Cabin has two bedrooms (one queen, two twins), one bath. Suitable for 4 adults and children. Less than 100 yards from beautiful 13 mile long Lake Wallenpaupack. Boat and wave runner rentals are available right down the street. Come fish and swim in warm summer and fall lake. Cozy Cabin is very comfortable and welcoming. We have a single bath, living room, full kitchen with all the accoutrements, including a crock pot and microwave, sweet sunroom and deck. You can see the water from the deck, in between the trees. Have fun floating around the lake on your raft! Enjoy the sunset from the beach and then a fire right in the back yard fire pit. Boat and water ski rentals available less than a mile from the cabin. Really close to Promised Land State Park and Delaware State Park for great hiking and snowmobiling trails. 35 minutes from Bushkill Falls, Big Bear Ski Area for winter fun Skiing, Snowboarding and Snowtubing. Price may be based on occupancy. 4x4 vehicle necessary to access in winter! Air conditioning available in warm weather months only. Bob and Kathy Smith, we are the owners of the cabin since 2010, Bob's Father purchased it a few years before us and put in hardwood floors and wood ceiling, new lighting fixtures, the sun room. We're always working to make it better! 4 night minimum stay in summer-time unless surrounding dates are booked and it's a 2-3 night availability. Just ask! It's warm and cozy in the winter and refreshingly cool in the summer and just up the street from the lake, we have an outdoor firepit and comfly seating everywhere. You can see the lake from the deck. It's a very relaxing getaway. Fresh mountain air that somehow relaxes you almost instantly. Fresh water to swim in at the lake, great fishing. You can see the stony beach and docks from the deck of the cabin and you can see the water through the trees from the sun room. WiFi is available for a $25 fee. All the items needed to cook a normal meal are at the cabin for your use. TV with basic cable, DVD player with small DVD collection. CD player. WiFi and Air Conditioning available. Small Washer and Dryer. Deck has table and four chairs and a gas grill. Parking for two vehicles plus watercraft. Contact me for more information and pictures! Cleaning fee may apply. 6% + 3% Sales Tax applies. Security Deposit is required or an insurance policy may be purchased for $49-$89....it's your choice. The place was warm and comfy. We really enjoyed our stay. We were so comfortable that the neighbors didnt hear any movement from us...lol. we were enjoying the quietness. Thank you. We definitely would be coming back. Just what we needed, a weekend away. This cabin was perfect for just that. We will definitely be looking to come back in the summer!! We loved the Cozy Cabin! We had an amazing stay the the cozy cabin! It had everything we were looking for. We especially loved the fire pit. We would definitely return, hopefully sometime in the near future. Stayed in the cabin for a guys' weekend away with two longtime friends from out of the area. The cabin was perfect for our weekend, very comfortable, cozy and ideally located by the lake for fishing and campfires. We loved seeing the deer in the neighborhood! I would highly recommend this cabin and we would definitely stay here again for our next trip to the Poconos. We loved the cozy cabin and the area. We had a great time and would definitely return! The on line pictures definitely portrayed this cabin as being nicer than it was. The cabin had a very strong musty odor and had a lot of animal (cat? Dog?) hair throughout. My son has moderately severe asthma and had a tough time in this cabin. Additionally, the linens did not seem fresh and clean so we bought our own. We had to pay for a cleaning service and WiFi - amenities that should have been included in the rental fee. Lastly, the photos of the lake give the impression swimming is permitted off the dock. Not so! It's been an extremely wet summer and that causes a slight musty smell in summer that disipates once the windows are open. I always ask people to let me know how the cabin was left for them by the previous guests, I didn't hear anything negative from you when you checked in. You requested the cleaning service clean for you upon your departure at the time you booked and all of the paperwork clearly stated there was a $25 fee for WiFi. Lastly, you certainly can swim off of the dock. I'm not sure what you're referring to. It's a GREAT cabin offerred at a very reasonable price as evidenced by the 22 very positive reviews I've received prior to this. Pocono Raceway is about 1 hour away. Mount Airy Casino is about 40 minutes away. Costas Family Fun Park 5 minutes away. Horseback riding at Triple W Stable - real riding, not in a line of people! Check them out! Ehrhardt's Waterfront Restaurant for beautiful sunset dining. Bushkill Falls about 45 minutes away. Great Hiking at Promised Land State Park and Deleware State Park about 15 minutes away. Nightly Rate: $75 - $220 Weekly Rate: $525 - $1540 Monthly Rate: Inquire Rates shown are for 2 adults per night. Summer rates are at the higher end of the scale. I am only booking minimum 4 night increments for Summer-time. Tax is 6% and 3%; PayPal fee is 3.5%; Processing fee 4% (I had to put it in as taxes of 16.5% to get the correct amount to tally) Best deal in the Poconos!